Pete & Gerry’s Heirloom Eggs and the Association of Food Bloggers challenged me to come up with an original crepe recipe. I knew I didn’t want to make a traditional white flour crepe. 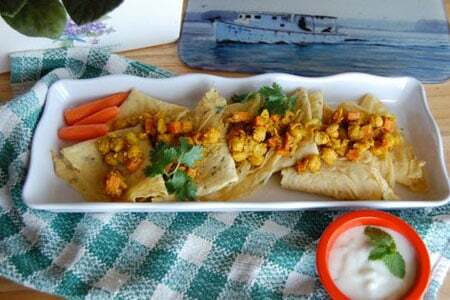 I had experimented with Egg Crepes and Socca (crispy chickpea crepes) before, so I wondered if I could create a recipe for egg-based chickpea crepes. If you aren’t familiar with chickpea (garbanzo bean) flour, it has about half the carbs, more than three times the fiber and one and a half times the protein of white flour. So, it’s the perfect choice for people with diabetes. Chickpea flour is also gluten-free. The nutty flavor of the flour sent me straight to the Indian section of my spice cabinet. I pulled out turmeric (read why turmeric is good for you), cumin seeds, black pepper, cayenne, and cinnamon. I thought chickpeas and carrots would be the perfect vehicles for these spices and I decided to add some honey to further enhance the sweetness of the carrots. One warning about using turmeric – it will turn everything it touches a lovely golden color. Be careful if you use wooden spoons, white bowls, etc. Once I nailed down the type of crepe and the spicy filling, I decided the dish needed a cool-down in the form of a creamy, minty sauce. I chose regular yogurt instead of Greek-style because I wanted the sauce to flow instead of being dolloped on top. 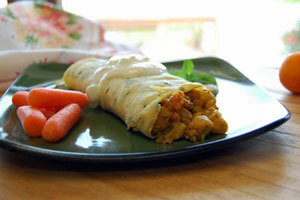 I prepared a test batch of chickpea crepes using eggs from my supermarket. 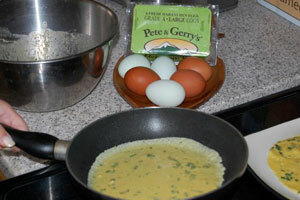 When my Pete & Gerry’s Heirloom Eggs arrived, I couldn’t believe the deep color of the yolks. These eggs were much richer in flavor and gave my crepes a sunnier color too. Accept that the first few crepes might not look perfect. They will still taste good. Select a round skillet or griddle that is the exact size you want your crepes to be. If you use a large pan and not enough batter to go all the way to the edge, your crepes won’t be perfectly round. I don’t recommend pouring the batter freeform. Find a measuring device to use so that you get the correct amount of batter in the pan each time. I used an 8-inch nonstick skillet and found that a 1/4-cup size dry measure filled about 2/3 full worked perfectly. Try different cups until you get one that works for your pan. When you flip the crepe, first loosen it on all sides. Quite by accident, I discovered that turning my spatula upside down when I slid it under the crepe worked well. Slide in the spatula, then use your other hand to flip the crepe. You may need to experiment with different sized spatulas to see what works best for you. Flipping from the side of the pan opposite the handle works best. If your crepes start having a ripple pattern, your pan is too hot. Reduce the heat, wait for the pan to cool a bit, then try again. These dazzling crepes are spicy, sweet, tangy and cool, all at the same time. They are diabetic-friendly, gluten-free, and higher in fiber than most crepes. If you are entertaining, you can make everything ahead of time and handle assembly at the last minute. Disclosure: I received one dozen Pete & Gerry’s Heirloom Eggs and a Lodge cast iron griddle for my participation in this contest. All opinions are my own. Combine yogurt, cucumber, honey and mint in a small bowl. Stir to combine. Heat olive oil over medium heat in a 2-1/2 quart saucepan. Add onion and cook for about 5 minutes, until onion softens. Add garlic, turmeric and cumin seeds; cook, stirring, for about 1 minute. Add cinnamon plus black and red pepper blend; cook, stirring, for about 1 minute. Add honey, carrots, chickpeas and broth. Increase heat, bring to a boil, then reduce heat to low. Cover and simmer for 20 minutes or until carrots are tender and most of the liquid has cooked out. Transfer half of mixture to food processor (don’t cover the hole at the top or the hot, confined mixture could cause an explosion) and purée. Return to the saucepan, stir well and season with salt to taste. Cover and keep warm. In a large bowl, whisk together water, eggs and chickpea flour. Add cilantro and stir gently. Heat an 8-inch nonstick skillet or griddle over medium heat. When it’s hot, remove from heat and spray with cooking spray. Fill a 1/4-cup dry measure about 2/3 full and immediately pour into the skillet, swirling to make sure batter reaches the edge and the crepe is as thin as possible. Cook until the edges look done and the top is dry, about 2 minutes. Run a spatula around the edges of the crepe, making sure nothing is sticking. Turn your spatula upside-down and lift one side of the crepe. Use your other hand to help flip the crepe. Cook for about a minute on the second side, then slide the crepe out of the pan onto a plate. Repeat with remaining batter, spraying each time and stacking crepes on plate. You should end up with about 12 crepes. Note if your crepes exhibit a “ripple” effect, your pan is too hot. You can serve in one of two ways: (1) rolled and filled or (2) quartered and covered. 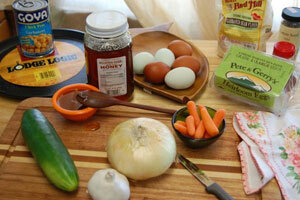 For (1), place a crepe on a work surface or cutting board. Place filling down the middle third of the crepe, then fold each side in. Turn the crepe over onto a serving plate and top with sauce. For (2), fold the crepe in half, then fold it in half again. Top with filling and sauce. About the challenge: Pete & Gerry’s Heirloom Eggs is sponsoring the Egg-Streme Crepe Challenge to inspire selected bloggers to create an original crepe recipe made with Pete & Gerry’s Heirloom Eggs. About Pete & Gerry’s: Pete & Gerry’s Heirloom Eggs features eggs with deep yellow, richly flavored yolks from Ameraucana and Marans hens. These hens receive all-natural feed containing no by-products, hormones or antibiotics. Pete & Gerry’s goal is to have their heirloom eggs raised on small family farms throughout New England. About the Association of Food Bloggers: Founded in 2009 by Malika Harricharan, Association of Food Bloggers is a site that serves as a directory of ethical and reputable food bloggers and is a resource for those bloggers. The site provides industry information as well as tips and resources for becoming a better writer and leveraging the power of Social Media. There’s just something about combining cucumber and yougurt that makes a great tasting suace for jus about anything! Perfect idea for crepes and the tips are great! Love this dish with all the spicy flavors! I have made buckwheat creeps before that turned out pretty good (after I got the hang of flipping!). Can’t wait to try this recipe! Delicious recipe! We are both on a similar wavelength using chick pea flour with a twist. ;-) Good luck! Yum! I actually just got a crepe pan…I will need to make these. Looks so great Shelby. I wold totally devour these!! Yum!! Really great looking crepes. I like the idea of using the garbanzo flour for these. And the filling looks totally yum, too. Wow, this looks amazing! I know my mom loves to cook with chickpea flour, so I will send her this and she will love it!